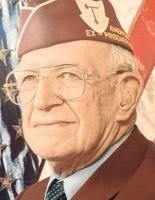 Dale Bowlin took part in the Battle of the Bulge as a member of the 70th Infantry Division. Serving as a radio operator for a 105 mm Forward Observer party, he was captured and wounded in February ’45 near Saarbrucken, Germany. He spent two months in German military hospitals before being liberated by the French Army in Donaueschingen, the source of the Danube River. His left leg was amputated shortly after capture due to a severed artery. Dale reconciled with member of the German unit the 70th fought against in the last months of the war. Date of Interview: March and June, 2012.